ON THE RADIO: Holocaust survivors and their lawyer discuss their insurance claims. 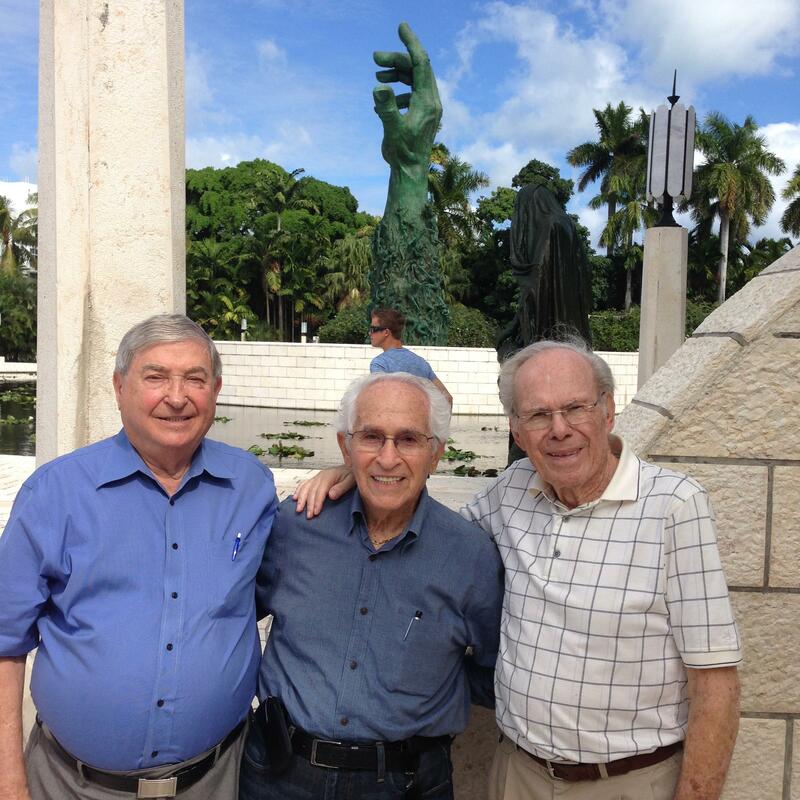 CLAIMANTS: From left, Holocaust survivors David Mermelstein, Israel Sachs and Herbert Karliner. According to the Holocaust Survivors Foundation, the survivors may be owed as much as $20 billion, including interest, that the companies have refused to pay. "There are survivors that can't get enough help," Mermelstein says, "and here lays $20 billion that is rightfully ours and we can't get to it." The survivors' demands for access to the records of companies such as Generali and Allianz AG, the German insurance giant, have been stymied by international machinations and a U. S. Supreme Court ruling that struck down state laws -- including one in Florida -- that demanded an accounting of Holocaust insurance claims. "The courthouse door is barred," said Sam Dubbin, a Miami lawyer and former Clinton-administration Justice Department official who represents the Survivors Foundation. "The companies are inheriting the money that is owed to the heirs and beneficiaries of people who went through hell." Some payments have been made. In 2007, the International Commission on Holocaust Era Insurance Claims ordered payments totaling $306 million to about 48,000 claimants. According to Dubbin, that's about three percent of what is actually owed. But the existence of the commission, and the agreement of the U. S. government to abide by its findings, is what led the Supreme Court to strike down the more searching and stringent state laws. "They said, 'Give us the death certificate.' Auschwitz didn't give death certificates." "They said, 'Bring us the policy.' I said Auschwitz didn’t save policies. They said, 'Give us the death certificate.' Auschwitz didn't give death certificates." Herbert Karliner, 87, lost most of his family to the Nazis while surviving on false papers with his brother in France. After the war, he managed to get hold of some original policy documents through the German consulate. It showed that his family's Allianz policy had been cashed out "to an unknown person" on Nov. 9, 1938. That was not only the day his father was picked up by the Gestapo and taken away, never to be seen again, it was also the date of Kristallnacht, the widespread anti-Jewish riots that began the Holocaust. "Obviously," Dubbin says, "what Allianz was doing was engaging in a massive scam where the policyholders were supposedly redeeming their policies on the day of this massive disaster." The survivors say they are down to their last two options: an intervention by the government of German Chancellor Angela Merkel or the passage by the U. S. Congress of a bill specifically authorizing them to sue the insurance companies for breaching their contracts. Either one would require President Barack Obama to make a case in their favor. 10/11/12 - Thursday’s Topical Currents begins with news about an ambitious Miami-Dade collaboration studying the holocaust and human rights. It’s called “LIGHT/THE HOLOCAUST & HUMANITY PROJECT”. The events include a soul-stirring ballet, awareness projects, youth concerts, a one-man play, a family festival and anti-bullying workshops. The third and final presidential debate took place last night at Lynn University in Boca Raton. President Barack Obama and Governor Mitt Romney sparred over various foreign policy issues, but seemed to agree on one thing: their allegiance to Israel. What's the deal, you’re wondering, with Jewish people and Chinese restaurants on Christmas? Two months ago, I was forced cancel my windstorm insurance due to the high deductions, meager coverage and exorbitant cost. For the past four years, the insurance lobby has run wild in their insatiable demand for bigger profits for insurance companies already flush with cash.